It is one of the leading events of its kind in the world. It brings together all actors in the value chain under one roof. The fair presents the latest solutions, trends and technologies for breeding and processing. It is for each company a unique opportunity to showcase their own products to an audience consisting mainly of decision makers from around the world. 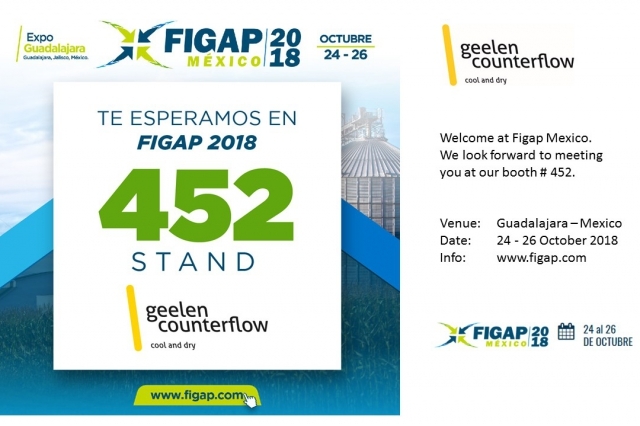 The FIGAP will take place on 3 days from Wednesday, 24. October to Friday, 26. October 2018 in Guadalajara. Early October a record number of 28 dryer customers from around the world participated in Geelen Counterflow's Dryer & Cooler Training 2018. Dryer customers from Ecuador, Peru, Japan, China, Thailand, Indonesia, Nigeria, Denmark, France, Serbia and Poland learned how to optimize their counterflow dryers for extruded aquafeed or petfood for best efficiency, uniformity and lifetime.